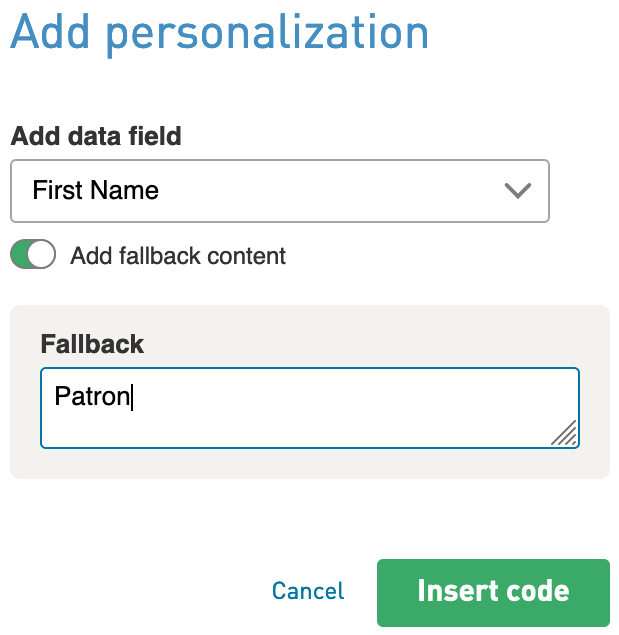 You can use data fields in WordFly to easily add personalized content to your email such as First Name and Last Name. You can add data fields to both HTML and Text emails. Data fields be inserted in any content field in WordFly including the subject line, body copy, header, footer or anywhere else you might enter copy. In Modern Editor you can add your data field using a text area by clicking Add > Data field. Note: You can always add a data field manually to your email design. Your data field must be added exactly as it is in Subscribers > Data Fields. Data fields are case sensitive. Your casing must match. 1. In your Modern Editor email, click on a text block from your Email Preview panel. This will open the Edit Content panel on the left side. 2. Click Add > Data field from the available edit content options. 3. Select the data field from the 'Add data field' dropdown. Click I'm Done when you are finished. Don't forget to enter any alternate data for that field if the data is missing. In an email campaign you can add a data field to your subject line using the Insert Data Field link. Note: You can always add a data field manually to your email subject line. Your data field must be added exactly as it is in Subscribers > Data Fields. Data fields are case sensitive. Your casing must match. 1. Open your email campaign from Email > Email Campaigns. 2. Click on the Settings tab of the email campaign. 3. Click on Data Field to insert a data field into your subject line. 2. You can also enter alternate data in case this data is not available in your list. The data field will appear in the subject line along with the alternate text if missing.